Cedarlane has been making low-fat, all-natural frozen entrees for over 30 years. These award-winning entrees are easy-to-prepare, delicious and affordable. Recently we were given the opportunity to try out the new Cedarlane Quinoa & Vegetable Enchiladas with Pablano Crema Sauce. These enchiladas are gluten-free and contain 12g of protein, 7g of fiber and only 340 calories per serving. Each enchilada is packed with quinoa, black beans, Monterey Jack and cheddar cheese as well as roasted Anaheim peppers, tomatillos, corn, bell peppers, onions, mushrooms, yellow squash, black olives, and zucchini—all topped with a delicious Poblano Crema sauce. The frozen entrees can be prepared in a microwave oven (4 minutes) or in a conventional oven (25-30) minutes making them a quick option for busy people. On top of that, I think they are really nice for people who transport a lunch to work or for those of us who need something hot and on-the-go. We do a lot of traveling and I love stocking our freezer in the camper trailer with frozen entrees like this. I can easily prepare them in the microwave and have a hot dinner on the table within minutes. Last week we needed something quick, easy and hot for lunch so I prepared both boxes of the Cedarlane Quinoa & Vegetable Enchiladas. As they were baking in the microwave my house started to smell sooooooooo good! That nice aroma really hyped up our taste buds before lunch even hit the table. Once they were done, we left them "stand" for 2 minutes per the package directions. Right from the get-go we were really impressed with them. Sometimes frozen entrees will come out of the microwave either crunchy hard or very soggy. These came out of the microwave with the perfect texture. Next...the combination of flavors is absolutely AMAZING. Every bite had a new flavor sensation. Sometimes you tasted the quinoa and at other times the veggies. The Pablano Crema Sauce really topped them off nicely! 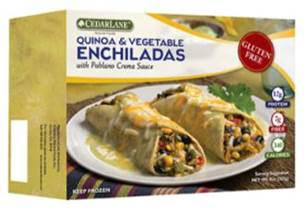 I would not hesitate in buying the new Cedarlane Quinoa & Vegetable Enchiladas. Matter of fact, I am going to look for them in my grocer's freezer section the next time I go grocery shopping. I think it would be nice to have several boxes of their entrees stocked in my freezer for when we need a quick bite to eat or will be out on the road traveling. You can learn more about Cedarlane and all of the delicious foods that they make by visiting their site online and by connecting with the company on Facebook. I have never tried the Cedarline products. I have been wanting to try more quinoa dishes and this frozen dish would be the perfect way to start. It sounds delicious.